A useful developmental tool and a bunch of toys combined - find the best baby walker on our top list! When your baby is making those first steps, you need to be there to support him when necessary. Unfortunately, that’s not always convenient for the parents, and that’s when baby walkers come into play. REMEMBER: Never leave your toddler with a baby walker alone! They are meant to use with parents watching and helping at all times. Almost all baby walker injuries happen when parents leave the children alone. Be a parent! If you want to buy a baby walker, have a look at our reviews of best baby walkers of 2018! Maybe you find something for your baby! Colorful beads within the clear cylinder allow baby to connect the sound to sight. Encourages baby to reach, tug, and bat, strengthening hand-eye coordination. 2-in-1 toy; use suctioned to a table or high chair tray, or remove base for floor play. Up first on our reviews of the best baby walkers is the Sit-to-Stand Learning Walker by VTech. This baby walker will be a good choice if you want less support to allow the baby to become more independent. This baby walker is designed for babies and toddlers aged between 3 months and three years. What’s remarkable about this baby walker is that it comes with an interactive learning center, which includes plenty of toys for your baby to have fun with. Its five piano keys allow the baby to play music and kick-start their creativity. The Sit-to-Stand baby walker also features a pretend telephone handset with mechanical elements for some role-play fun. To help the baby develop motor skills, the Sit-to-Stand baby walker includes two colorful spinning rollers, three light-up buttons, and three shape sorters. Among other fun elements of the walker are more than 70 sing-along songs, music, and sound effects. The convenience of use is always a welcome feature with any baby product, including walkers, so VTech made sure to equip this walker with wheels that work both on hard floors and carpets. The rear wheels also have two tension settings to make pushing easier or harder for the baby. An excellent choice if you want the baby to be more independent. Versatile, removable learning center with plenty of games and sound effects. Can be easily used on both hard and carpeted floors. Adjustable tension of the rear wheel. Lacks steadiness due to the lightness. Bright Starts Roaming Safari baby walker is a bit easier for babies who have just started to walk. That’s because it offers more support for the baby with its ring-shaped cockpit! Walk-A-Bout baby walker would be ideal for toy car loving babies as it has a steering wheel on its removable toy station. The baby could drive the baby walker with the accompaniment of various sounds and music built into the toy station. Remarkably, this baby walker has three height settings to adjust to the baby as he grows. Bright Starts doesn’t indicate the age range of the walker, instead suggesting the weight range – 15 – 26 pounds. Lastly, the Walk-A-Bout baby walker has a foldable design to allow you to store the baby walker easily. Three height positions to adjust to the baby’s growth. Foldable design for secure storage. Includes a machine-washable seat pad. The large green loops on the sides may be a hazard for the baby. Joovy Spoon Walker is maybe the most noteworthy of the best baby walkers we have reviewed. While it doesn’t come with any toy stations to entertain your baby (so you’ll have to supply the little one with toys), it is of exceptionally high quality. And it should be as its price is quite steep! The Spoon Walker comes with an oversized tray, which could become very useful when feeding the baby. The snack insert of this baby walker is dishwasher-safe. This baby walker also boasts a convenient and safe seat pad for the baby’s comfort as well. It can be removed easily for cleaning in a washing machine. This baby walker also has three height positions, but a noticeable number of users complained that it gets small for the baby very quickly. The walker supports up to 33.5 inches in height, so make sure that your baby won’t overgrow the walker in a couple of weeks before buying it. Short. The baby might overgrow the walker quickly. If your baby loves Disney characters, then this Safety 1st Walker might be the ideal choice for your baby! This baby walker comes with entertaining Disney toys with multiple developmental activities. Apart from that, the walker features 12 charming songs and a flashing light to help your baby have some fun. The baby walker features a small tray to allow you to enhance your baby’s fun with other toys if you wish. The tray can be easily cleaned by wiping, which will be great if you plan to feed the baby while in the walker. As you might expect, the Ready, Set, Walk! Mickey Silo walker allows for 3-setting height adjustment. This walker supports 30 lbs. of maximum weight, so make sure that you won’t be getting this walker for just a couple of weeks due to your baby grows out of it! A good range of toys and sound effects to entertain the baby. Wide base for great support. Three height positions for the baby. Not the best choice of materials regarding quality. The base makes it a bit hard to transition from bare floors to carpets. Up next on our reviews of best baby walkers is the Baby Neptune (Ocean Explorer design) Walker by Baby Einstein. This baby walker is a nice choice for those who want a simplistic walker, and in the case, your baby doesn’t get bored that easily. Lovers of nautical motifs will also like this walker! 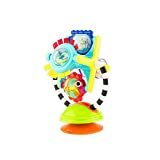 The Ocean Explorer is equipped with a removable toy station with toys and sound effects to entertain your baby. It also features a steering wheel, which will help the little one to develop the adventure-seeking spirit, allowing him to explore the world independently. While this baby walker doesn’t have any adjustable height settings, it does come with straps that help regulate the comfy seat, which could to some extent provide the baby with the desired level of comfort as he grows. Speaking of the seat, it features a high back for extra support of the baby’s back. Steering wheel to help your baby uncover that adventure-seeking spirit. Comfortable seat with adjustable straps. Not very easy to switch from bare floors to carpets. The two loops in the sides may be hazardous for the baby. If an affordable baby walker is a thing you are looking for, have a look at Kolcraft Tiny Steps 2-in-1 Activity Walker. This walker is noteworthy for its 2-in-1 design, as you could have guessed from the name! It means that the baby could use the walker while seated or walking behind it, depending on how well he feels with less support when standing. Regarding entertainment, Tiny Steps Activity Walker offers three developmental toys – a spinning ball for batting play, bead bad for motor skill development, and a flower mirror toy with crinkle petals. The seat pad height of this walker is adjustable, allowing for the support of up to 32” tall babies. The supported weight range is 15 – 26 pounds, so this baby walker is a better choice for younger kids. Kolcraft Tiny Steps baby walker folds down quite easily for convenient storage. Apart from that, the seat pad could be removed and washed in a washing machine, so your baby will always feel fresh and comfy! Easily converts from seated to a walk-behind walker. Skid-resistant friction pads on the base for safety. A bit difficult to turn for the baby. Combi Baby Activity Walker is a rather interesting baby walker, in large part due to its interesting design. It is costlier than most other walkers we’ve reviewed, but it does have a lot to offer! Firstly, it will be great for babies who love cars and especially girls. In fact, this walker might be the best choice for car lovers because of the variety of features it can offer. Apart from the steering wheel, Baby Activity Walker has two side mirrors, plenty of sounds effects, and toys for the baby to have fun with. Once you remove the hood, you gain access to a large tray area to put the baby’s snacks or toys on. Apart from that, the Baby Activity Walker has a jumper feature to slightly diversify the pastime of your baby. But keep in mind that this walker is a bit stiff as a jumper so that it may be not the smoothest experience for the baby. Electronic play tray with sounds, lights, mirrors, and toys. Removable car hood with tray space underneath. A bit difficult to adjust the height. Up next on our reviews of best baby walkers is yet another walker from Disney! Music and Lights Walker is a great choice for girls thanks to the walker’s pink color and princess-themed toys. Apart from the rather wide choice of toys, Music and Lights Walker features engaging sounds and lights to entertain your baby girl. Apart from playing, the baby walker could also serve as a snack tray after you remove the entertainment center. This baby walker is equipped with grip strips on the bottom, which are designed to reduce movement on uneven surfaces. Those strips significantly complicate movement on carpets, but this could be resolved by just removing the strips. For increased convenience, Disney Music and Lights Walker feature three height positions for the baby. Apart from that, the walker can be easily folded down for easy storage and transport. The removable entertainment center exposes an oversized snack tray. Dirt tends to get stuck on the wheels. You need to remove the bottom grip strips to allow the baby to move the walker on carpets. So many car-themed baby walkers on our reviews and the Delta Children Lil’ Drive Baby Activity Walker is the next one we will be examining! This one might be a better choice for boys than Combi Baby Activity Walker. And it’s also more affordable! The Delta Children baby walker has quite the versatile entertainment station with buttons for sound effects, lights, as well as what every car needs – a steering wheel and a shift stick! If it’s time for your baby to eat, you can remove the toy tray to expose the snack tray to put all the food and drinks on. For the convenience of the parents, this baby walker can be folded flat for convenient storage and travel. Apart from that, it features three height settings to grow with the baby. Electronic toy tray with sound effects, lights, and a steering wheel. Folds flat for travel and storage. Baby Trend Trend Walker is another nice choice if you want more free space for the baby to play with his toys. 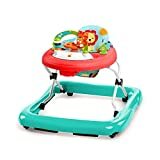 This baby walker is quite basic in terms of toys, offering only a bead bad for motor skill development. If that’s fine for you and your baby, then this baby walker will be a nice choice, especially considering its price! The toy bar can be removed to provide you with more area to put the baby snacks or other toys on. Trend Walker features a three-position adjustable seat with a high padded back. The seat could also be removed for washing. Another great feature of this baby walker is that it can be folded flat for convenient storage and transport. The extra-wide base of the baby walker should be mentioned as well – it provides your baby with more stable support, which can be very important if the baby has just started to learn walking. Though keep this in mind if the space in your residence is limited. Large tray for toys and snacks. Extra-wide base for superb stability. Another Disney baby walker on our reviews of best baby walkers! This one is also a great walker for girls thanks to its pink color and Minnie Mouse-themed toys! When it comes to toys, the Minnie Music and Lights Walker is pretty basic, so you might want to have your girl’s favorite toys prepared when using this baby walker. It has 12 inbuilt songs though! The two separate toy trays are designed to swing open to expose the snack tray, which is quite large. Unfortunately, in some cases, the swing-open toy trays don’t work as intended, so it might be easier to just remove them instead of swinging up. As it is with the majority of baby walkers, the Minnie Music and Lights Walker features a 3-position adjustable and removable seat with padding. Some users complained about the lack of padding on the bottom of the seat, so you might need to put a piece of cloth there if necessary. The foldable design making the life so much easier is also here! Nice choice for baby girls. Two activity trays with Disney characters. Sturdy wheels for carpets of bare floors. The opening trays are not executed very well. The bottom of the seat could be padded better. If you want to save up on all those sound effects that may end up frustrating you and the baby more than helping, try out Cosco Simple Steps Walker. This walker has only two toys, but on the other hand, your baby will have more opportunities to enjoy the rest of his toys. Another nice thing about the basic set of toys is that the snack tray is unobstructed at all times. It is also removable, which can allow you to clean it easily. In fact, the snack tray is dishwasher-safe! The seat of the Simple Steps Walker can be removed for machine washing. A nice thing about the padded seat is that it also is dryer-safe, which can help you save a little bit of time. Cosco Simple Steps Walker has two height adjustment settings, which will, to some extent, allow the walker to adapt to your baby’s growth. But this walker will be more short-lived when compared to other walkers because of these fewer height positions. Machine-washable and dryer-safe seat pad. Only two height levels might make the walker short-lived. Your kid adores Batman? Then he will certainly like KidsEmbrace Batman Baby Activity Walker! This baby walker lives up to its slightly higher price thanks to its quality materials and detailed design with lots of things to entertain the baby with! There aren’t many toys on this baby walker and there’s a reason for it – the whole baby walker acts as a toy car. Turning the attached key, the baby will hear the engine starting and the walker vibrating. The gear shifter will also make sounds when shifting, and the steering wheel will allow the baby to feel himself the superhero he is! This baby walker is also very comfortable thanks to its quality polyester foam seat (which can be removed and machine washed) and the high back support. Excellent choice for little fans of Batman aged between 8 and 18 months. Comes with a variety of flashing toys and sounds. Removable and washable polyester foam. Could be difficult to maintain the middle height position. If the other Disney baby walkers for girls weren’t nearly enough for your girl, then Baby Minnie Mouse Peek-A-Boo Walker might be! This one comes with a ton of toys, including a roller drum, bead chaser, and a removable piano station with lights and sounds! The seat pad of this baby walker features a high back section for better support and convenient rides. The seat pad can also be removed to be machine washed. What also adds to the convenience is the folding-down design of the walker, as well as three height settings. It seems that the Peek-A-Boo Walker has slight issues with maneuverability, as well as going through carpets. So if you have a lot of carpets at home, you might want to avoid this baby walker! Removable and washable seating pad. A bit hard to maneuver. Not so good on carpets. And the last walker on our reviews of best baby walkers is yet another Disney baby walker! This one is Winnie the Pooh-themed, adding to the roster of famous Disney characters for your baby to choose from! This baby walker comes with 4 Winnie the Pooh-themed toys, as well as 12 inbuilt songs to entertain him. The toy tray is a bit difficult to assemble though, as evident from user reviews. Once you remove the toy tray, you will be able to use the snack tray to hold baby food. What’s also removable is the padded seat, allowing you to machine wash it quickly. Ease of use on both bare floors and carpets is quite essential for many parents, so this baby walker will undoubtedly satisfy you in that regard. And lastly, this Disney baby walker features 3-position height adjustment, which is, in fact, the main downside of this walker as it is more or less challenging to use. Two swing-up toy trays with 4 Winne the Pooh-themed toys. Removable and washable padded seat. Works on both floors and carpets. Slightly challenging to adjust the height. Assembling the toy tray is not very easy. When is the right time to introduce a walker? Any parent would wish the best for their baby and would want to ensure the best life for him/her, especially in the earlier stages of life. However, this sense of care might not be as helpful without the right know-how. In the case of baby walkers, wanting to introduce this helpful tool to your baby as early as possible might seem helpful. However, by introducing it too early, you may more or less impair the development of your baby! The baby might not be able to use the walker safely – baby walkers require some level of motor skill to be used safely. Without developing the most basic ability to stand up first, they may lose balance in the walker. The baby might get used to the walker too quickly – a more evident risk is the baby becoming dependant on the walker, forcing them to, in part, re-learn how to walk without the baby walker later on. Baby walkers are very handy in helping your baby develop in part on their own and giving you some free time between helping them walk yourself. They can also act as mobile toy boxes with a bunch of developmental as well as simply fun toys for your little bundle of joy. Having gone through what we consider to be the best baby walkers on the market right now, it’s difficult to suggest one that would fit everyone’s needs the best. This is because of the various design differences, price ranges, and amount of features/toys that come included. What we can say is that all the baby walkers on our list are reliable and would be a helpful addition to the arsenal of tools you need to give your little one the best first years of their life. We hope that our list of the best baby walkers has been helpful and if there’s anything you wish to ask, just leave it in the comments below! Amazing blog ! Really helpful guideline to choose right one for litter one.Baby walker is a nice toy to entertain baby and to satisfied kids curiosity. I am trying to fulfill all essential things that my kids needs to build his development. I am searching best baby walker to his walking help. Thanks for sharing really helpful guideline to choose best baby walker for my baby. The reall the issue is parents not watching their kids in walkers. Baby walker is a nice toy to entertain baby and to satisfied kids curiosity. I am trying to fulfill all essential things that my kids needs to build his development. I am searching best baby walker to his walking help. Thanks for sharing really helpful guideline to choose best baby walker for my baby.